This FREE leadership training event is designed to inspire and equip laity, lay staff, and clergy. Training sessions target specific church leadership roles plus a variety of exciting ministry topics. Everyone is invited and encouraged to attend! Learn and share new ways to be God’s light in your community! 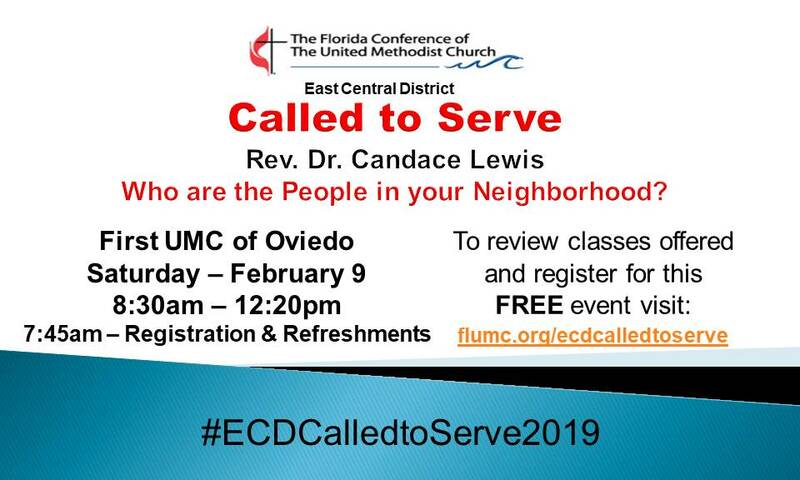 To review classes offered and register for this event go to: flumc.org/ecdcalledtoserve. Free child care for children up to 5 years of age with advance registration. Contact the church office (407-365-3255 or info@fumco.net) no later than Tuesday, February 5th. To make this event as successful as it has been each year, we need lots of volunteers to help greet the many visitors who will be coming to our campus on this day. Volunteers will still be able to attend registered sessions, although you do not have to register if you just want to lend a hand. Sign up using the form below or contact Charlene Davis in the church office (407-365-3255 / cdavis@fumco.net) for more information. February 9, 2019 8:30 a.m. – 12:20 p.m.